Natural disasters during your overseas trip can cause havoc to your travels in more ways than one. Then add the financial loss you may face due to change your itinerary or extra cost for medical and evacuation care for you and your family. From now through November 1, when hurricane season ends, your clients may be at risk when traveling. To prepare for the unexpected, the U.S. Travel Insurance Association (UStiA) suggests they purchase travel insurance, which can protect their trip investment and provide travel and medical assistance and benefits. Our guests, you, want to make sure your overseas travel is well protected from any financial losses such as from unforeseen hurricane events. This hurricane season make sure you add the iTravelInsured trip cancellation benefit that also includes international medical and international evacuation cover. This travel insurance benefit package is offered by one of the top international medical insurance companies in the United States, International Medical Group. Our IMG international medical insurance benefits provide trip cancellation and interruption benefits in the event an unforeseen natural disaster or an inclement weather condition prevents them from going on a trip or forces them to return early. The iTravelInsured products also provide medical benefits, including coverage for accident and sickness medical expenses and emergency medical evacuations. They also provide overseas travel benefits such as travel delay, missed connection, loss and delay baggage, sports equipment rental as well as cancel for any reason. Additionally, iTravelInsured, a subsidiary of IMG, offers a multitude of travel insurance programs. These programs provide protection, among others, for emergency illness or injury to you or a travel companion or immediate family member causing you to cancel or interrupt your trip, jury duty, job layoff or termination, terrorist events, bankruptcy or default of the airline, cruise line or tour operator or a natural disaster. Our Patriot Platinum travel medical cover, https://www.gninsurance.com/patriot-platinum-travel-medical-insurance/, also includes the option to add the evacuation plus rider. This also provides up to 10,000USD for medical evacuation related to natural disaster as well as an additional 50,000USD for non-life-threatening medical evacuation. 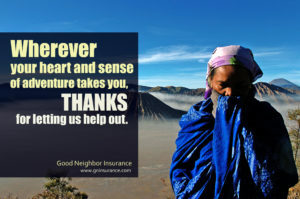 We have another great travel insurance plan here at https://www.gninsurance.com/trawick-safe-travels-international-travel-insurance/. Our Trawick Safe Travels overseas travel insurance provides up to 25,000USD for political and natural disaster evacuation benefit.